The one-bowl-only-brownie-like chocolate cake is very easy and quick to make. It´s not overly sweet when you use dark chocolate for the chocolate cream on top and good quality cocoa powder for the cake batter. Since I ran out of coconut sugar, I opted for simple brown sugar, but you can easily replace it with any sweetener of your choice. Just make sure not to keep the cake for too long in the oven, otherwise it´ll loose the moisture. I also used homemade blueberry jam to add a little fruity sweetness that goes very well with the airy chocolate cream. I can imagine that it would taste even better with freshly made chia jam. You can use any jam leftovers you have at home. I highly recommend doing the chocolate cream a day in advance to make sure that it gets firm nicely. The cake can be made for pretty much any occasion you can think of and will definitely satisfy your cravings for something chocolatey! For the cream: Heat the coconut milk and coconut oil in a small sauce pan over medium heat. You don´t have to wait until it boils, it just should be hot enough to bring the chocolate chunks to melt. Add the chocolate and stir virtuously until no chunks are left. When the mixture is smooth and shiny, add agave syrup to the taste. Put it into the refrigerator for at least 3-4 hours or overnight. For the cake: Preheat the oven to 175C°. Add the dry ingredients: flour, cocoa powder and baking powder to a bowl and mix well until combined. Mix the milk with the sugar and oil and stir well until the sugar dissolves. Add to the bowl with the dry ingredients and whisk until no flour lumps are left. Transfer the cake batter to a round cake pan that you covered with parchment paper before and bake for about 25min. Let the cake cool off for about 10min. and cover the surface with a thin layer of jam. Put the chocolate cream into a piping bag and frost the cake with the cream using your favorite piping technique until no cream is left. Keep the cake in a dry and cool place. 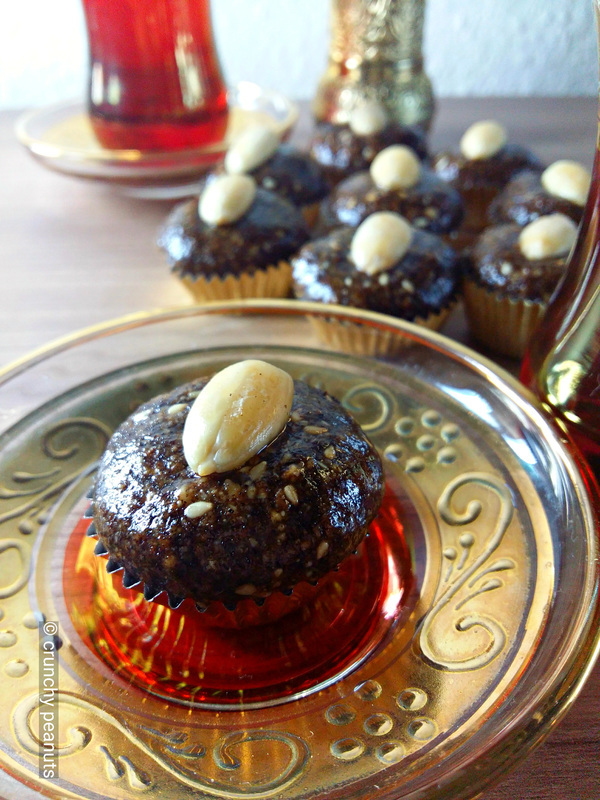 Slilou (or Sellou, Sfouf, Zmitta) is a delicious nut based Moroccan sweet usually prepared during Ramadan. I won´t lie it´s definitely not low in calories and a sweet that can´t be eaten in higher amounts since its very filling, but it´s very nutritious and healthy. 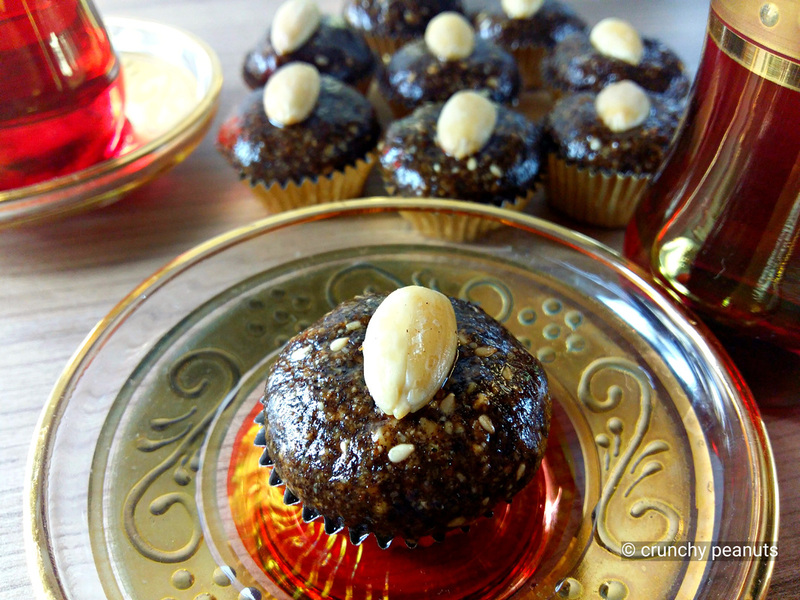 I´m a big lover of Middle Eastern flavors and this sweet is an impressive mixture of roasted almonds, sesame seeds, golden roasted flour and aromatic spices, so it definitely fits the bill. As with most of recipes, every family has its own and they also vary strongly from one region to another. I wrote down the recipe a while ago and don´t really remember where I´ve found it, but no matter which adjustments you make, the result will be the same: a rich energy paste with an outstanding flavor! 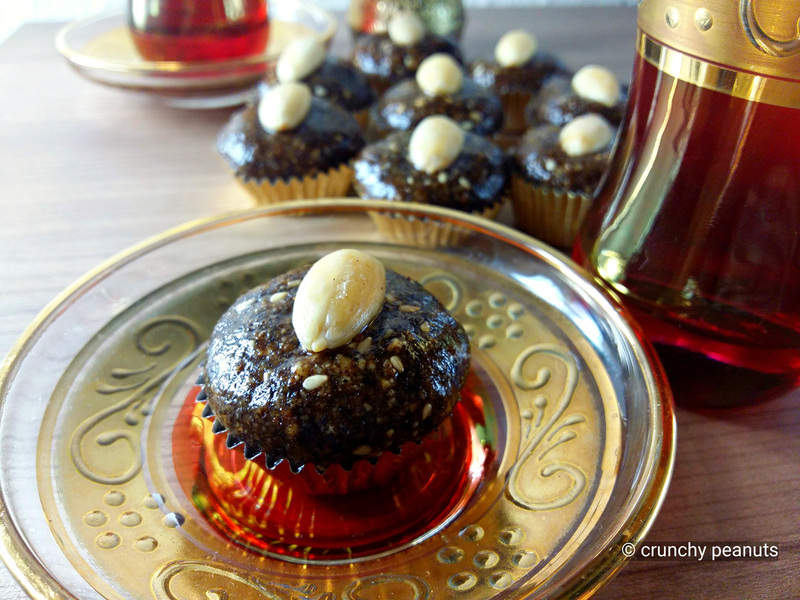 In Morocco, it´s also traditionally consumed by nursing Moms to increase the milk production. I highly advice you to play around with the recipe and adjust it to your own liking. The ingredients are mostly very easy replaceable, the only ones that really should go in are almonds, sesame seeds and aromatic spices. I´ve made the recipe with roasted flour, but I personally don´t find the taste that appealing. You have to be also very careful, because it´s very easy to burn the four, which will alter the flavor significantly. 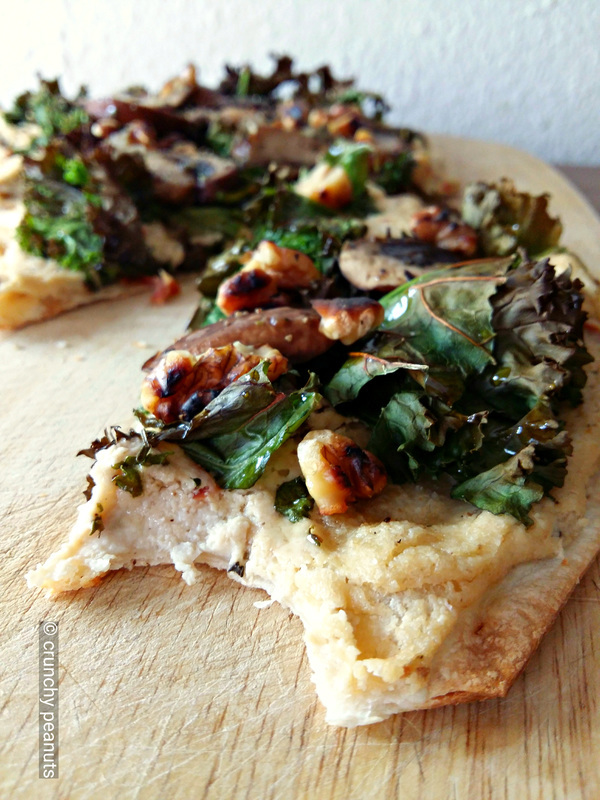 Next time, I opted for unroasted oat flour and it was even more delicious. I replaced the traditionally used butter with a mixture of coconut oil, pistachio oil and argan oil. Instead of using sugar or honey, I added maple syrup and date syrup, that´s why I reached a much darker color than normal. If you wish to make the recipe more traditionally, you´ll have to roast the flour in the oven until golden. Preheat your oven to 200C°. Place the flour on a baking sheet and spread evenly. Roast the flour until golden or until it doesn’t have the raw flavor anymore. Stir every 5 min. to avoid burning. (Be careful it will produce a lot of smoke). When the flour is done, sift it and set aside. If you wish to use oat flour, just blend 200g. of oats until you reach a powdery consistency. Blanch your almonds by covering them with boiling water and adding about 2 tsp. soda to it. Let it sit for about 10min., drain and peel off the skins. Roast in a pan without oil for about 10min. until golden, but not burnt. Let them cool completely and blend to powder afterwards. Make sure not to blend for too long, otherwise you´ll be left with an oily paste or nut butter. In the same pan, roast your sesame seeds until golden. Let them cool and blend to powder. Now, mix all the dry ingredients together: the flour, all spices, cooled and powdered sesame seeds and almonds. Add the maple syrup and oil and mix well with your hands until the wet ingredients are well incorporated into the dry ingredients. Shape into small balls or any shape you wish. Decorate with some almonds. Store in the fridge for up to 1 month. 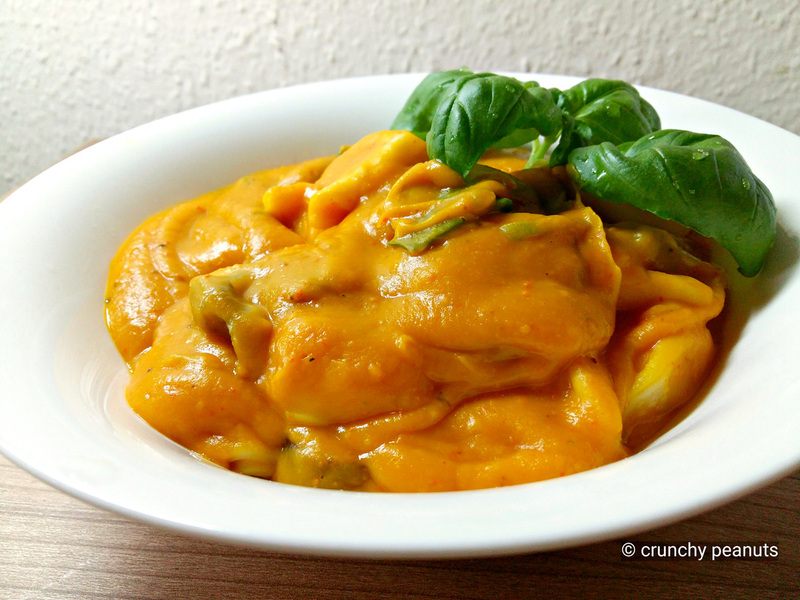 I don´t know about you, but my ultimate comfort food has to be creamy. Like creamy vegan mac’n’cheese, creamy chili sin carne, creamy cheesecake, creamy peanut butter, creamy cashew cheese on a pizza, creamy chocolate ganache, creamy smashed avocado, creamy…Ok, I think you get the idea. I guess my soul needs creamy textures to keep itself smooth. I mentioned the word “creamy” 10 times already, so you can probably imagine by now, which texture this sauce has. And it has roasted pumpkin in it. 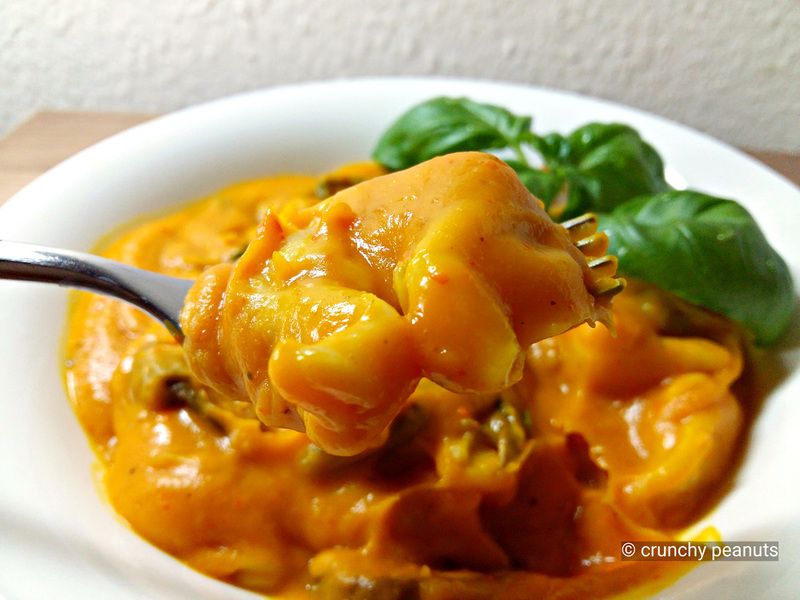 Pumpkin is velvety and velvety is close to creamy, so its double creamy comfort food. Plus there are root vegetables swimming in it and that keeps you rooted. So, this dish has the power to maintain your emotional stability without visiting a therapist. Not that you need to see one. But, you know just in case…So, let´s get on with it! Preheat your oven to 230C°. Bake your (unpeeled, but without the seeds) und cut in half pumpkin until soft for about 20-25min. 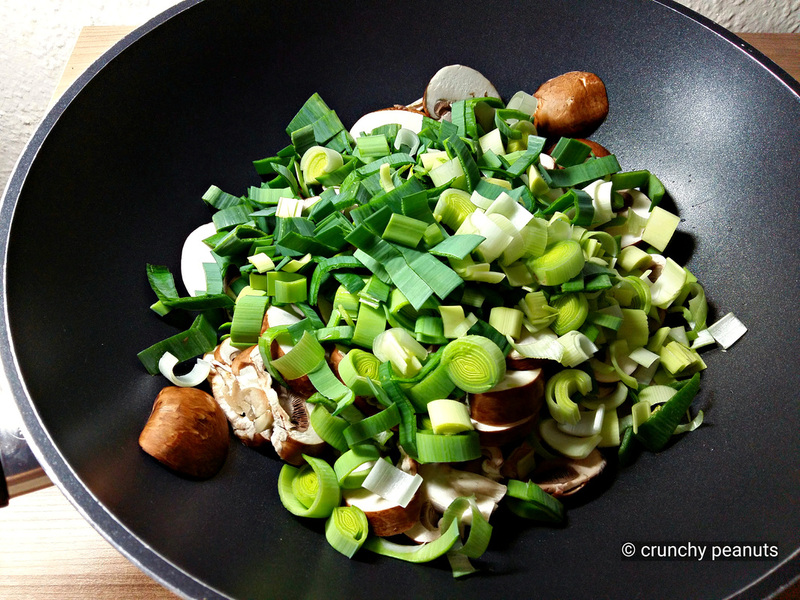 In the meantime, cut the mushrooms in slices and chop the leek. Heat few drops of oil in a large pan and fry the mushrooms with the leek for about 3-4min. until the leek turns bright green and the mushrooms soften. Set aside. Cook your tortellini according to the instructions on the package for about 10-12min. Drain and set aside. Put the coconut milk, veggie broth, lime juice, garlic, ginger, curry paste, nutmeg, salt and pepper into a blender and blend on high speed until creamy and slightly frothy. Add the roasted pumpkin and blend again until no chunks of pumpkin are left. Add a little bit more veggie broth or water, if it´s too thick. 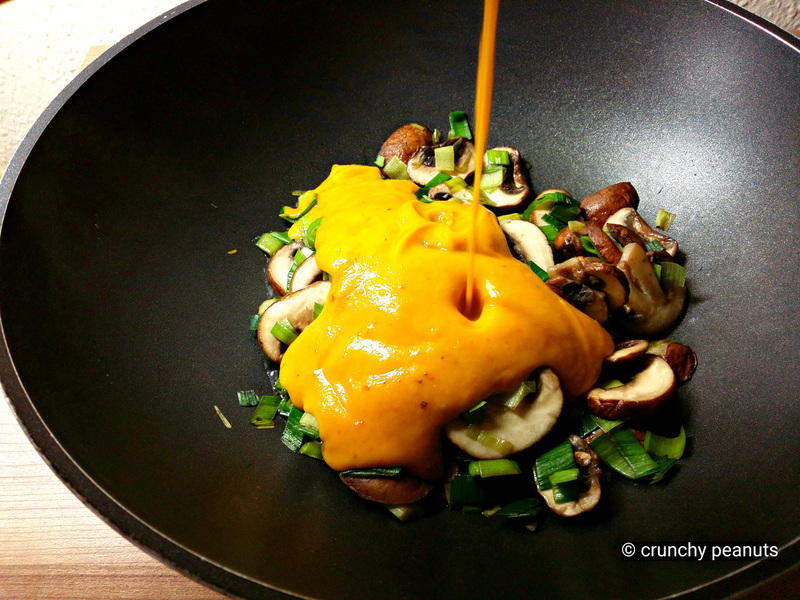 Add the pumpkin mixture to the pan with mushrooms & leek and bring it slowly to cook. 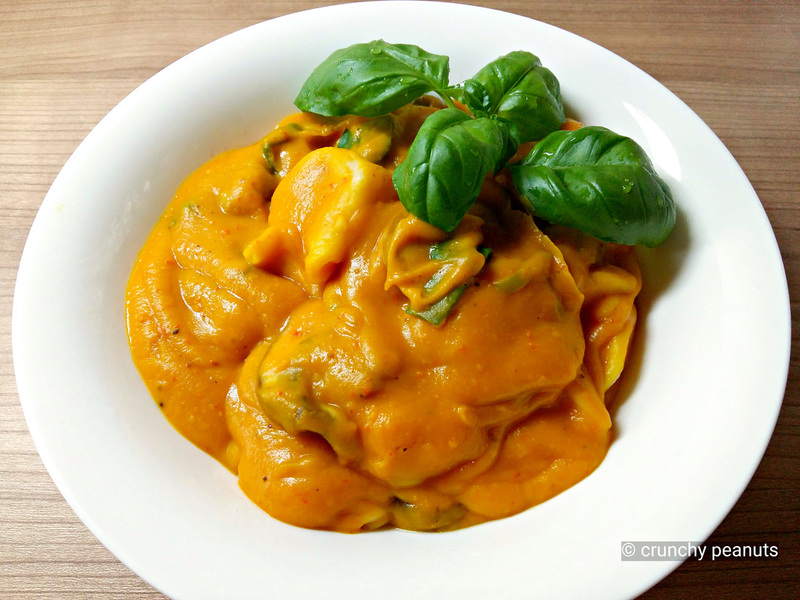 Gently add the tortellini to the sauce and stir until combined. Serve warm and garnish with fresh herbs and some roasted pepitas, if desired. Besides my obsession with pumpkin, figs and pomagrates during autumn I´m addicted to making tarts and oven baked crispy things in the colder months. 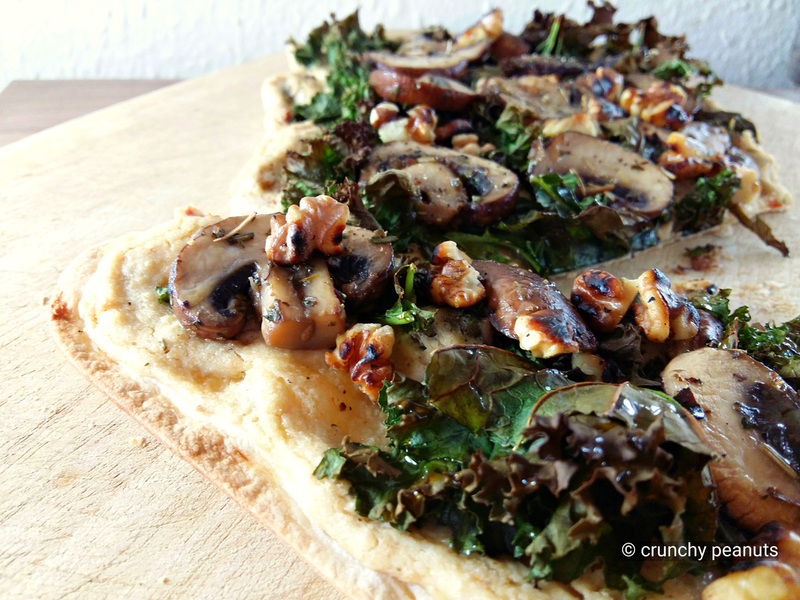 For this tarte flambée I used up cashew cheese leftovers from yesterday. Since I needed the lunch to be ready in under 30min. I cheated and opted for a store bought pastry. 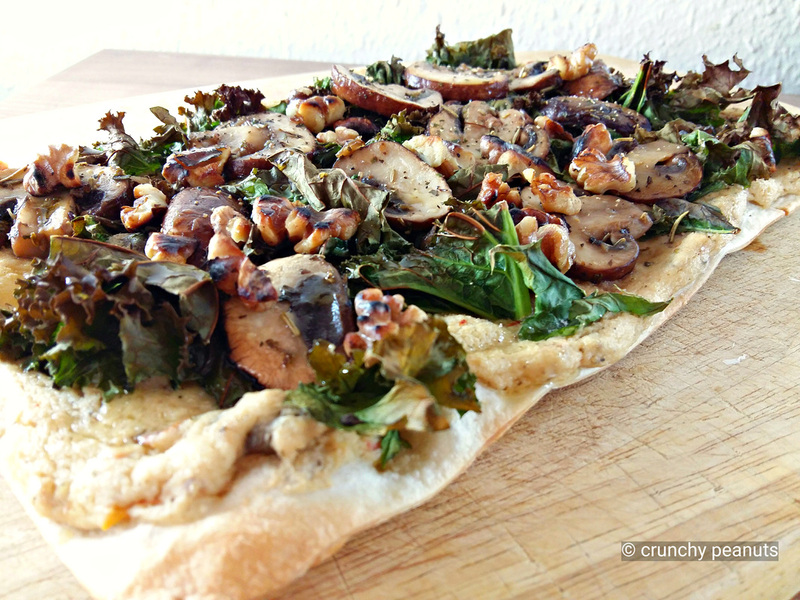 The cheese pairs wonderfully with the crispy kale chips, mushrooms and roasted walnuts. Caramelized onions or leek would work great here as well. 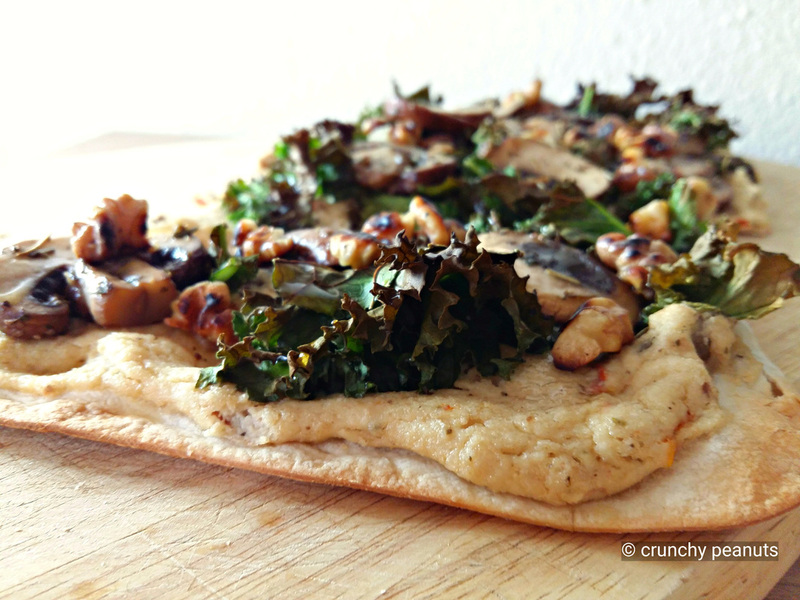 This is the elegant and grown up sister of the puffy and doughy pizza. Heat your oven to 250 C°. Place the dough on a parchment paper. 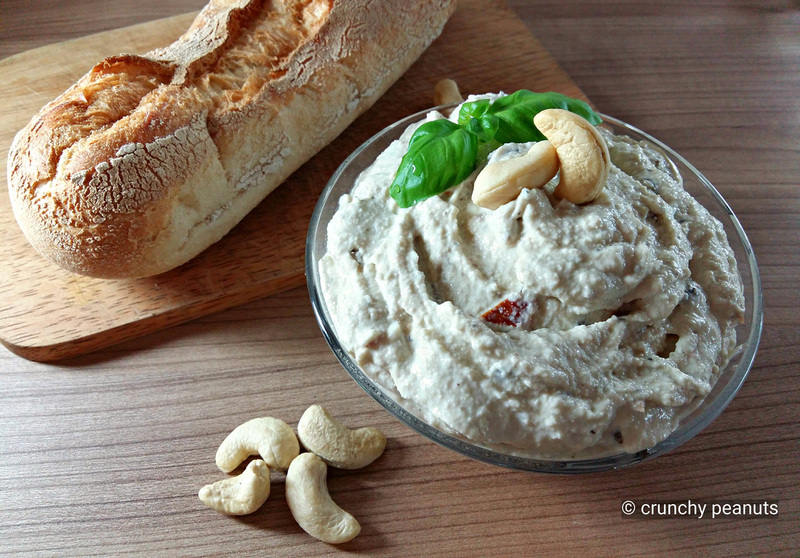 Cover the dough generously with cashew cheese. 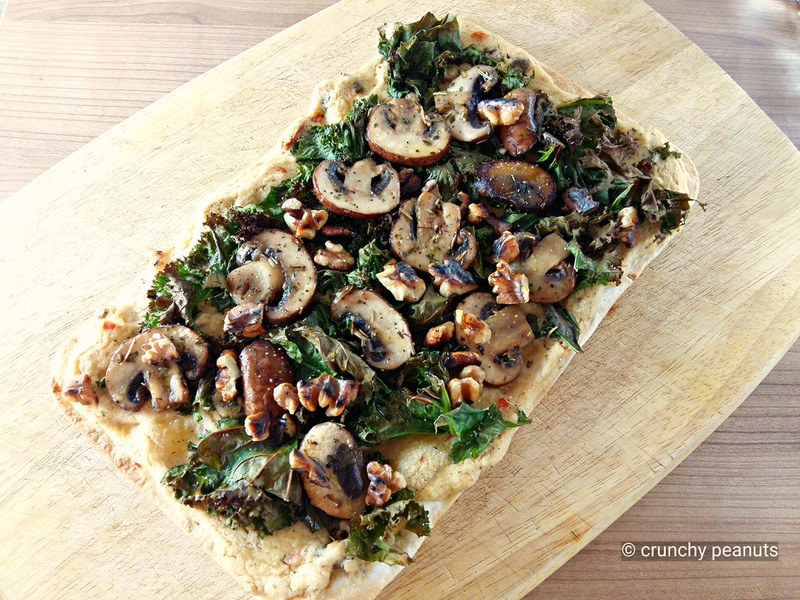 Top the cheese with kale and bake for about 7-8min. until the dough crisps up on the edges. In the meantime, slice up the mushrooms and heat few spoons of oil in a small pan. When the pan is really hot, add the mushrooms and minced garlic. Fry for about 3-4min. until golden brown. Add the nutmeg and mediterran herbs, stir until combined and put aside. In the same pan, roast roughly chopped walnuts until crispy. 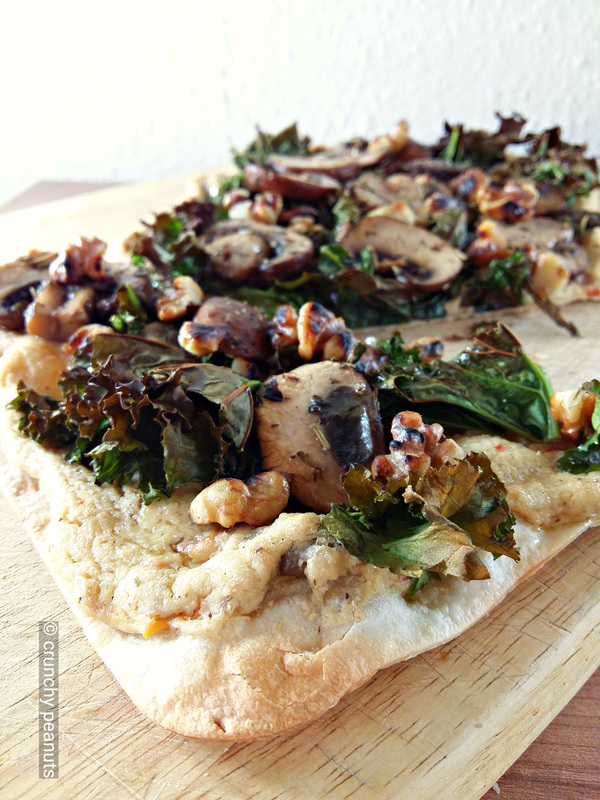 When the pizzas are ready garnish them with the mushrooms & walnuts and drizzle with few spoons of your favorite oil. Serve warm. It always amazes me, how transformable simple things like nuts and grains are. 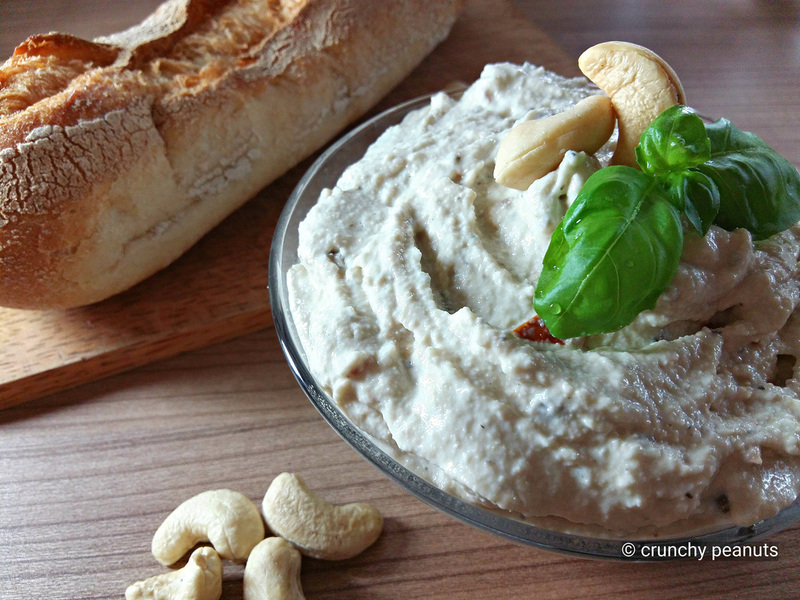 Before I went vegan nuts were already my favorite snack, but I would have never imagined that it´s possible to make creamy and cheesy bread spread just by soaking them and adding some umami taste in form of yeast flakes and some simple spices. Or to blend them together with a splash of lemon juice, agave syrup and a pinch of aromatic vanilla extract just to be left with the most velvety and smooth “cheesecake” that doesn’t leave you feeling bloated and overstuffed. It´s pure magic really. That makes me always wonder, how many unknown food combinations and flavors are still undiscovered and how generous our nature is by providing us with such a variety of edible things to choose from, so everybody can find something that suits him/her. This cheesy spread is definitely one of my favorites. I´ve already done it uncountable times before varying the ingredients every time, but this flavor combination is the one I always return to. Soak the nuts and seeds overnight, drain well and put aside. Cook the millet for about 20-25min. until completely cooked and soft. 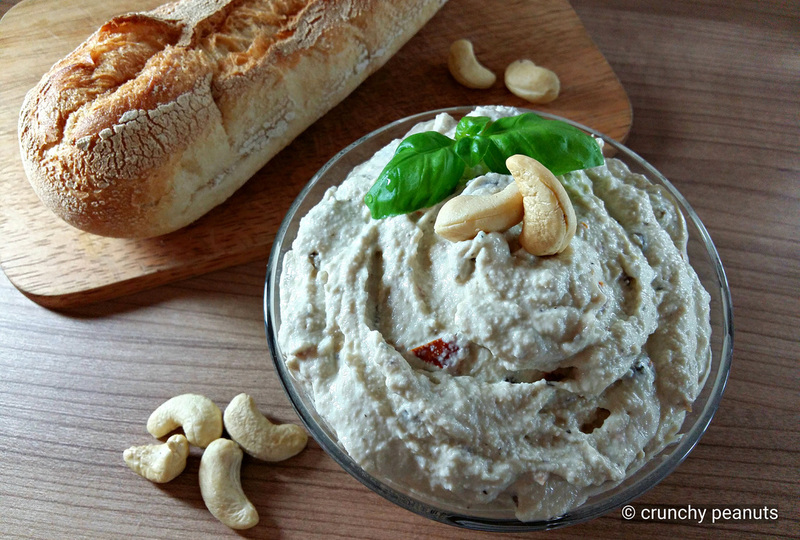 Blend the nuts/seeds with the cooked millet and all ingredients listed above except the mediterran herbs mix, tomatoes and olives on high speed until smooth and creamy. 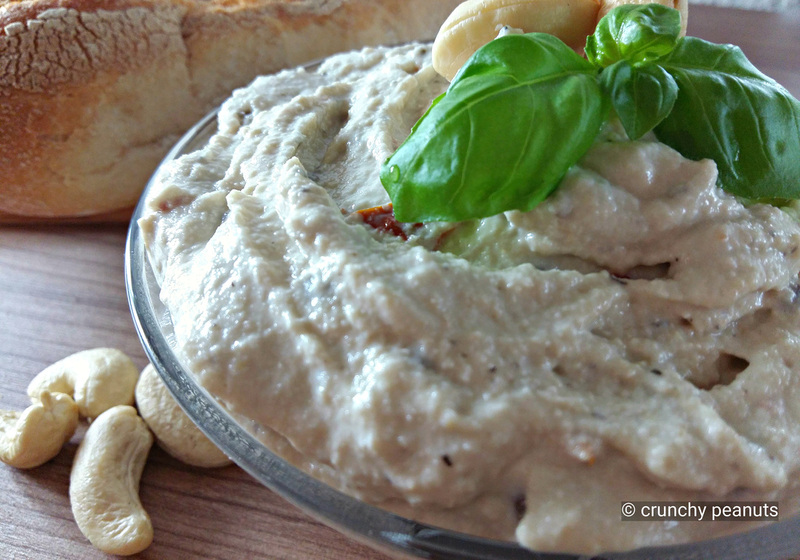 When the mixture is creamy and smooth add dried tomatoes, olives and the herbs mix and stir well until combined. Keep in the fridge and serve cool. The cheese will firm up more in the fridge, so don´t worry if the consistency isn’t right directly after the blending.